Inspire a sense of adventure with the Elemis Life Elixirs Embrace Candle; a powerfully aromatic candle that infuses your abode with an exhilarating fragrance. 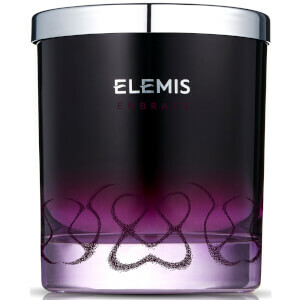 Arriving in a branded, purple glass tumbler with a stainless steel lid, the luxurious Embrace Candle will complement and enhance any room in the home. The candle is created by intelligently blending 21 pure essential oils, including Vetiver, Frankincense and potent Rose Pepper to deliver a sensuous scent with a stimulating effect. Simply light the wick, close your eyes, drop your shoulders and inhale the uplifting scent.